Family holidays in Spain don’t have to mean crowded resorts on the Costas. 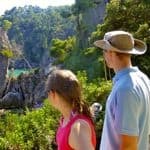 These inspiring trips take you to some beautiful and unspoiled parts of the country, whether you’re looking for child-friendly walking in the Pyrenees or a cycle through rural Mallorca. Everything’s taken care of, from trip notes and luggage transport to family accommodation. 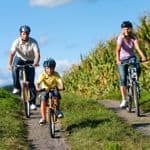 The thought of family activity holidays in Spain might conjure up images of popular resorts, crowded beaches and water parks. However, our range of holiday ideas could not be more different or provide a more delightful contrast. Can you imagine walking or cycling from hotel to hotel along gentle country trails? Or staying in a remote country cottage deep in the Spanish countryside? On our self-guided cycling and walking holidays, your luggage is transported between hotels, so all you need carry are the bare essentials. You travel entirely at your family’s own pace, using our detailed route notes as your guide. 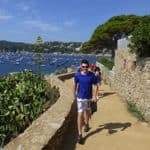 Our Coast of Catalonia walking holiday gives you the best of both worlds – gentle walking through beautiful scenery, stopping off for a refreshing dip in the sea, with a hotel with a pool waiting for you at the end of each day. There’s a more rugged and challenging option in the stunning Catalan Pyrenees, ideal for families with older children. If you prefer to explore on two wheels – we provide top quality bikes and helmets – how about exploring the less known coastline of Mallorca or the medieval villages and unspoiled beaches of Catalonia? 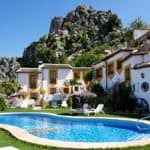 If you prefer to explore from one base, with self-catering facilities, there’s a lovely choice of cottages and houses in Andalucia. Find out more about our activity holidays in Spain and our other family holiday ideas.